Traditional roofs are framed using rafters that extend from a ridge beam down to the top plates of bearing or perimeter walls. The slope of the rafters shapes both the ceiling and the profile of the house. 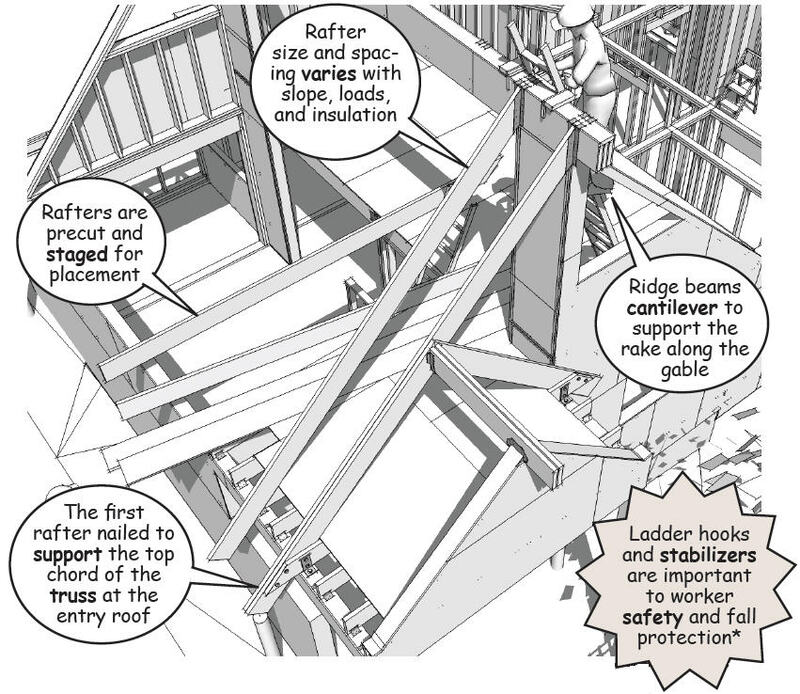 Structural connectors similar to those used in the floor framing are used to tie the rafters to the ridge beam and the top plates of the bearing walls. The connectors counter uplift and lateral loads imposed on the house by wind or earthquake. The connectors are predrilled according to engineered nailing patterns that prevent over nailing in the field. High strength “joist” nails are used instead of common framing nails to secure the rafters at the connector. It’s important to tie off or block ladders at the top and base of the work area to prevent falls caused by displacement or slippage. The slope of ladder should be about 75 degrees or approximately one unit horizontal for every four units vertical. For example a 24-foot ladder should be set out approximately 6 feet at the bottom of the ladder. 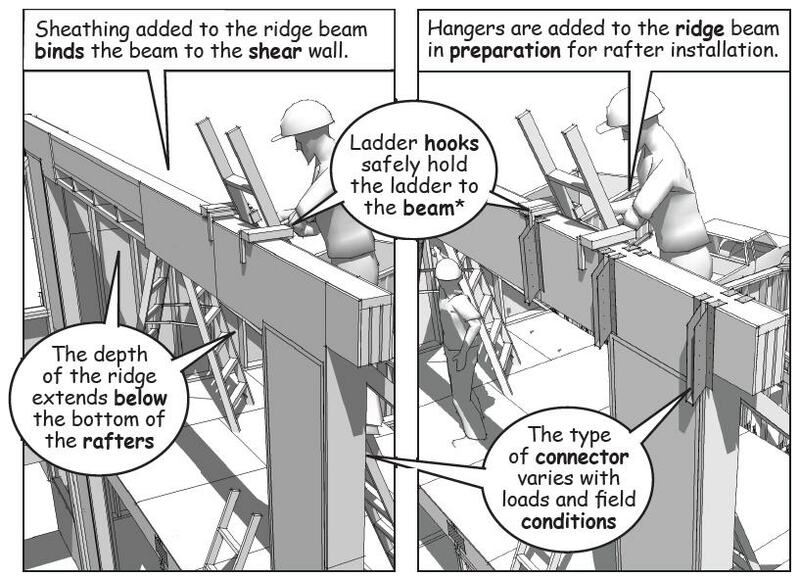 See safety requirements and hook attachments for construction ladders at www.wernerladder.com . 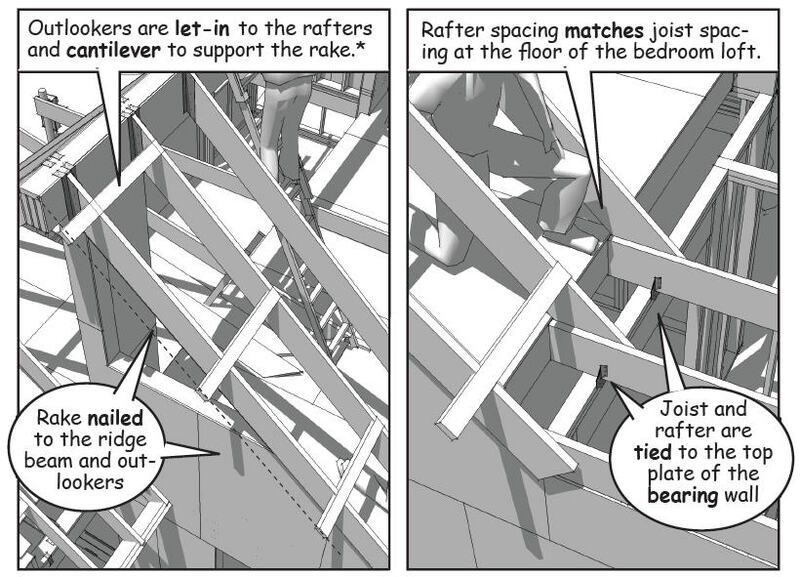 Rake rafters support the overhang at the gable ends of a roof. These rafters extend beyond the face of the perimeter walls and are held in place by outlooks (or outlookers) that are “let in” to the top of the main roof rafters. 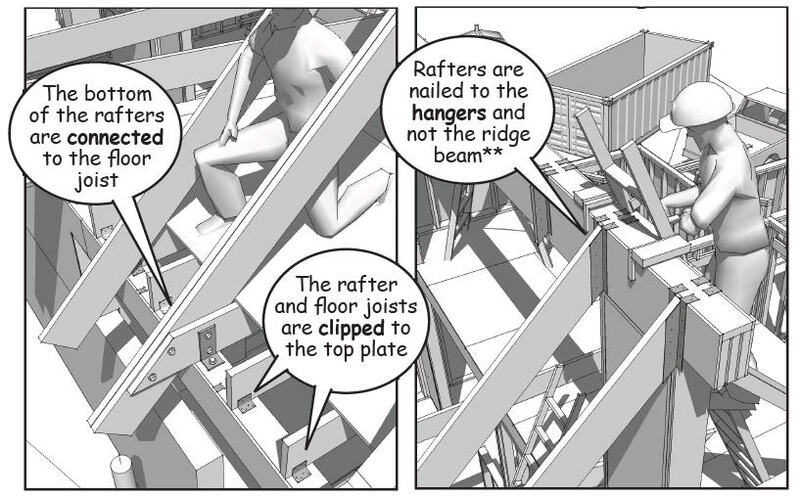 The rafters are notched to receive the outlooks so that the top of the outlook is level with the top of the rafter. The outlooks cantilever beyond the face of the wall to support the rake rafters. Outlook spacing depends on the length of the overhang and the wind load requirements of local building codes. 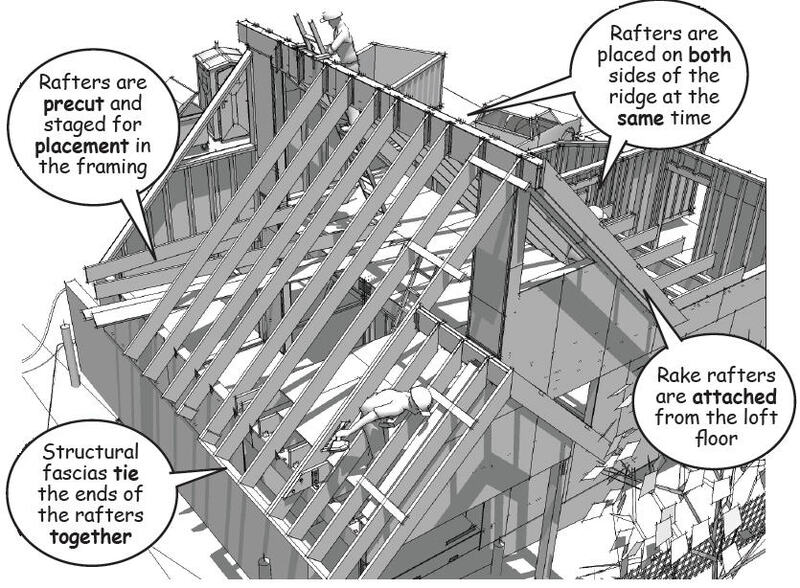 Rafters are precut to match the required slope of the roof. 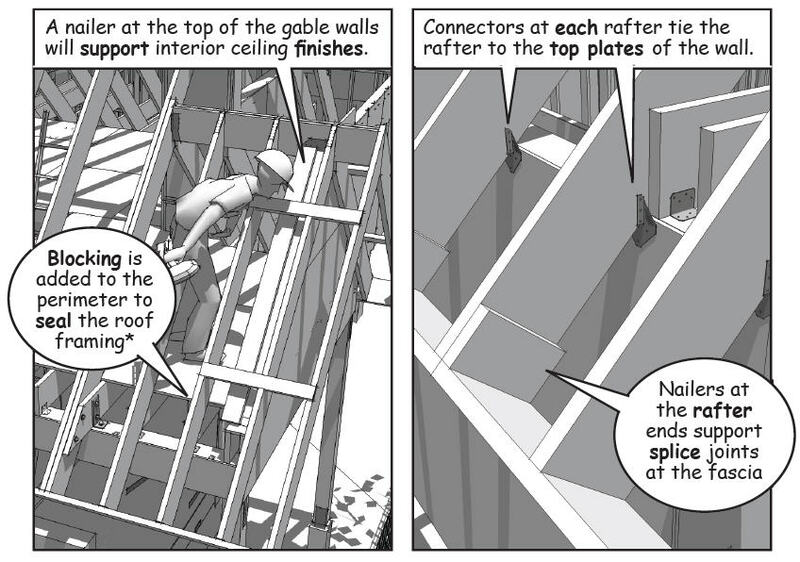 Though structural connectors make it structurally unnecessary, many skilled carpenters prefer to cut bird mouths into the rafter at the bearing points to provide a flat surface for the roof loads. The end of the rafters cantilever past the perimeter walls to a structural fascia according to the requirements of the overhang. 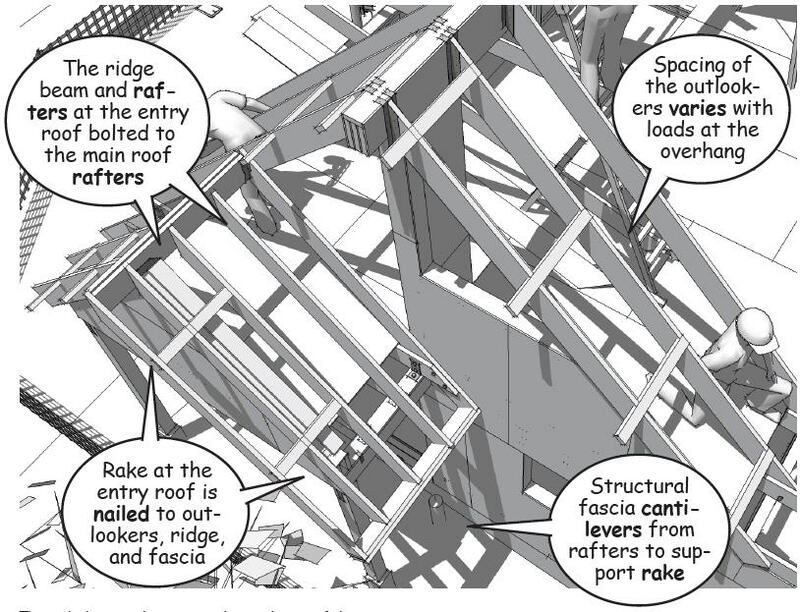 The fascia is structural because they tie the rafters together as a single unit and distribute roof loads to neighboring rafters. Blocking is added between the rafters at the perimeter wall to prevent fire on the outside of the house from entering the space between the rafters through the soffit.